Maida Heatter's Mile-High Cinnamon Bread — knead. bake. cook. I followed this recipe to the tee which is generally pretty rare and even whipped out a thermometer to measure temperatures. In general, I like to do things by feel, especially when it comes to bread but this time, I decided to follow it step-by-step because I wanted to get it right and I wanted those swirls. In some ways, this bread is a lot easier than other cinnamon bread recipes. The dough is fairly standard and close to a plain white bread dough than a sweet dough filled with tons butter and eggs. And omg, you get to use a food processor! I love kneading but, man, does using a food processor really make things easier. Sometimes the transition between stirring and kneading can get tricky especially if not enough flour is added to the dough while stirring and then it's a sticky mess once you start kneading. But, not with this method because the food processor does all of the work. Don't forget your ruler because measuring is required to get the proportions just right. First, you roll it out in one big 22 x 12 inch rectangle. But compared to Povitica, that really isn't all that bad. The hardest part of that is making sure that you get it as even and as square as possible. I even made my corners square as suggested! There is no butter that is brushed on this bread which makes the inside less gooey. Instead, a mixture of water and vanilla extract is used to bind the cinnamon sugar mixture to the dough. Some patience is required to do all of that and evenly sprinkle the cinnamon sugar mixture on top. 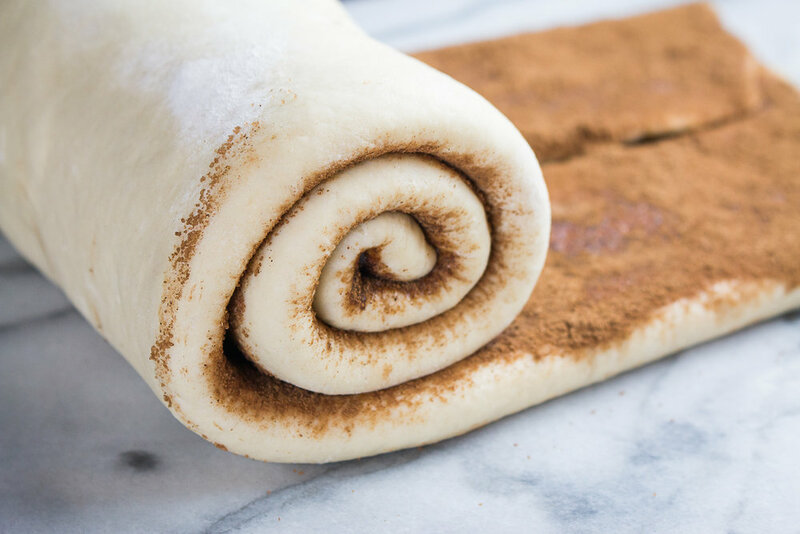 To achieve all of those layers, you fold the dough instead of trying to get it as thin as possible in a single layer. It doesn't look much here, but don't forget, there are twice as many layers hidden in there! To finish, there is an interesting scoring method which provides a cool crust, and a crunchy sweet one with the sugar. I found that this made cutting into it a bit tough. But that may have also been because I was eager to cut into it while it was still a bit warm. Kristen and I literally ooh-ed and ahh-ed at all of the layers. It's taste is reminiscent of a grocery store cinnamon bread but with a luxurious addition of cocoa powder and the sense that you have achieved something great. I only like raisins in bread and I think having some in here would be an excellent addition. I like this toasted and with a lot of salted butter. In a liquid measuring cup, stir ½ teaspoon of the sugar into the warm water. Sprinkle on the yeast, stir together, and let stand at room temperature for 10 minutes, until foamy. Meanwhile, heat the milk and the butter to 90 to 100° F, either in the microwave or in a small saucepan over medium heat or in the microwave. The butter doesn't need to melt completely. Place the flour, remaining ¼ cup sugar, and salt in the food processor. Pulse to mix. With the motor running, add the yeast mixture, then the milk-butter mixture, and finally, the egg, through the feed tube. (Maida recommends adding the milk mixture into the cup with the yeast so that you get every bit of yeast into the dough.) Process the mixture until it forms a ball, and then continue to process for another 30 seconds. If the dough is too stiff, add a few drops of water. If the machine slows down, remove about half and then process the two halves separately and knead them together in the next step. On a board or work surface, knead the dough for about 1 minute. Then place it in a buttered bowl, turning the dough to butter all sides of the ball. Cover loosely with plastic wrap and set in a warm, draft-free spot to rise for about 1½ hours: It should be well-risen and doubled in bulk. Then, lightly flour a board or work surface, keeping in mind that you'll need a lot of room. Turn the dough onto the floured area and press down to deflate it. Fold in the two opposite sides to meet in the middle, then fold in the remaining two sides to meet, so that you've formed the dough into a square. Press down to flatten it slightly, then cover loosely and let stand for 10 minutes. Meanwhile, butter a 9-inch by 5-inch loaf pan. Set it aside and prepare the filling. To make the vanilla water, mix the water and vanilla together in a small cup. To make the cinnamon sugar, whisk together ⅓ cup sugar and the cinnamon, cocoa, and nutmeg. With a floured rolling pin, roll the dough to form a rectangle that's 12 by 22 inches. Make the corners as square as possible. If you're having trouble with the dough shrinking back, pause briefly before trying again. Use a pastry brush to brush about ⅔ of the vanilla water all over the dough. Maida says to be careful not to miss any spots—"this is important." You can use a couple teaspoons of additional water if necessary. Then, sprinkle ⅔ of the cinnamon sugar slowly and carefully in a thin layer over the moistened dough. ("If you sprinkle too much in any one spot, you will not have enough to cover all the dough—so be careful.") Now fold the two long sides of the dough in one at a time, so that the meet each other in the middle. Pinch them together gently to seal the seam. Gently roll over the surface with a rolling pin to flatten the folded dough to about 7 by 25 inches. Use the remaining vanilla water to wet the dough and sprinkle the remaining cinnamon sugar over top. Now, the fun part: Making a very fat jelly roll. 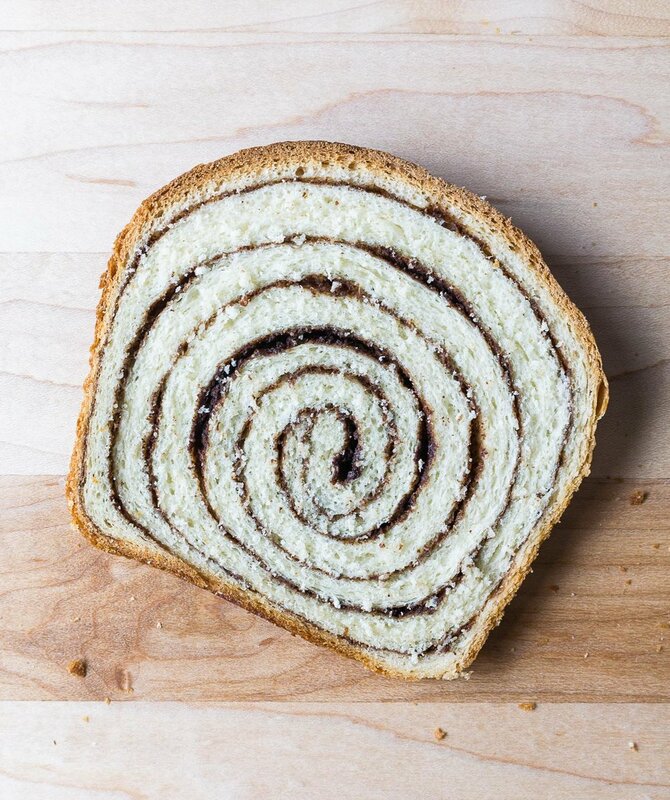 Starting at the narrow end, roll up the dough, making a thick spiral. When you get to the end, brush a little plain water on the loaf at the spot where the end will hit. Pinch the end a bit to seal it. 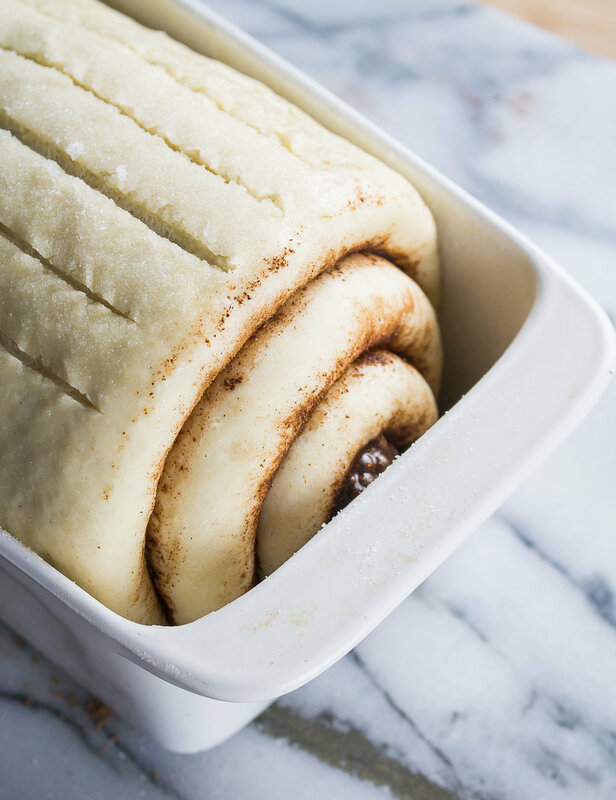 Carefully and gently place the roll, seam side-down in the buttered pan. The roll of dough should nearly fill it. Sprinkle about 1 tablespoon of sugar over the loaf. Cover it loosely with plastic wrap and place in a warm, draft-free place to rise for about 1 hour, until almost doubled and about 2 inches above the top of the pan. Meanwhile, adjust the oven racks so that you have one rack one-third up from the bottom of the oven. 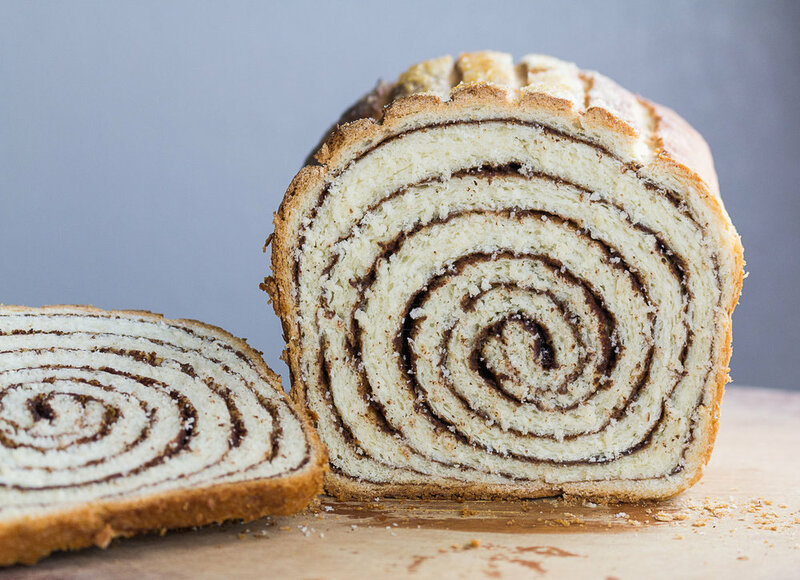 Heat to 350° F.
Just before baking, cut slits in the top of the loaf with a sharp knife: Maida recommends six long slits, only ¼-inch deep so that you don't expose the cinnamon sugar layer. Bake on a sheet pan for 45 to 50 minutes. You may need to cover the top loosely with aluminum foil towards the end of baking to prevent over-browning. Bake until the loaf, when removed from the pan, sounds hollow when tapped with your fingertips. Cool on a rack. Store, wrapped well in aluminum foil, for 3 to 4 days at room temperature.